Home Front has been designing, manufacturing and installing School Play Equipment for 20 years. So we understand the best way to combine the play demands for each age group. We also know that in many cases space and funds are squeezed, so we can help make the best use of your area and your money. And we work with you in the design stages – always bearing in mind the need for playground supervision, incorporating other school activities and, of course, budgets. Whatever your age group, be it Nursery & Reception or KS2, or even fitness equipment for all age groups, we can help get the perfect school play equipment installation for you. Above you can see just some of the categories of School Play Equipment we can help you with. But of course sometimes something special is required. We can work with you at the design stage to incorporate your wish list and then create CAD images of the project. This is especially useful if you are working with a PTA or funding body to source the money. They can really see what their money is being used for. It also allows the children to “buy into” the project and get a feel of what their new playground could look like. What about safety ? Well there is a common standard for play equipment in public areas called EN1176. While this is not mandatory we always strongly recommend that any school planning on developing their playground adheres to it. It covers a number of design and construction details which are conceived with the protection of the children in mind. All our equipment complies with this standard. Of course, children can still fall off any sort of equipment. Hopefully the safer surfacing you have installed will avoid the worse kind of injuries, but sprains and broken bones are, unfortunately, always a possibility. By using EN1176 compliant equipment you, the operator, are showing that you have excercised your duty of care towards your children. Home Front can provide tall, adventurous play equipment for KS2 children, or smaller units for KS1 or younger. Whatever your requirement our school playground equipment is extremely sturdily built from pressure treated timber for maximum durability. And it comes with a full choice of activities – slides, climbing walls, monkey bars, nets, rock walls and so much more. The Commercial Play label at the top of the page has categories of the different types of play equipment we can offer. 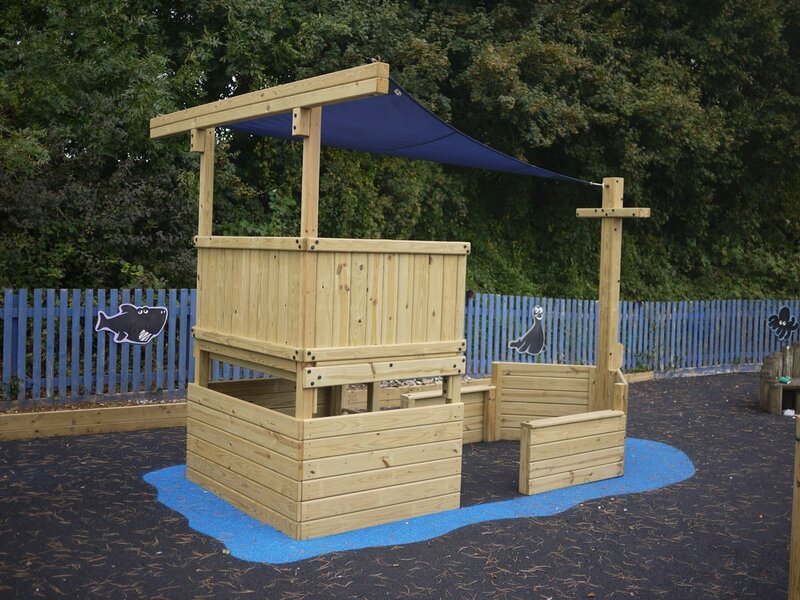 Please explore our range – we can provide multi play towers in various sizes, playtrails and a selection of fabulous adventure ships and adventure forts. Or just have a look at our Photo Gallery which has a selection of some of the many commercial projects we have completed in schools all over the country.